You’ve made your diagnosis. 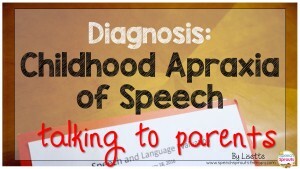 Now it’s time to talk to the parents about Childhood Apraxia of Speech (CAS). Just explaining the report and your findings may be not enough. So what do parents need from you? 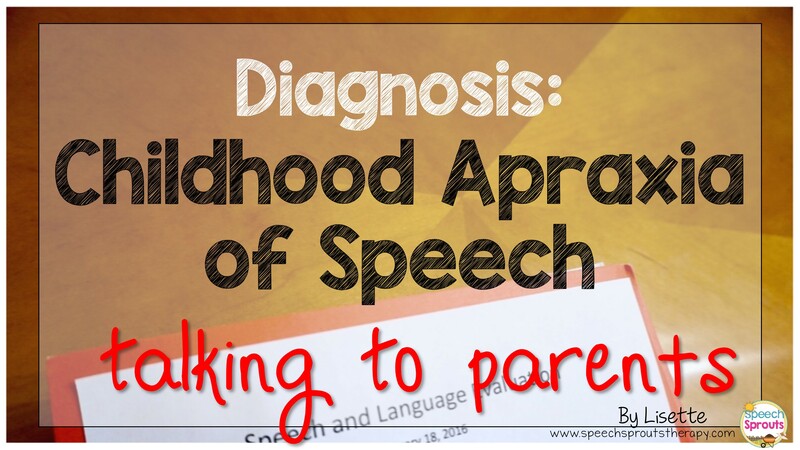 When my son was small, he had a severe speech sound disorder. I was not an SLP then, and I didn’t realize at the time what was the range of “normal”. I thought he would simply grow out of it. Don’t children develop at different rates? He would get so frustrated when trying to tell us things, and we couldn’t decipher his meaning. But his doctor had never mentioned anything. Looking back, he probably didn’t talk much to the doctor. My oldest son was in kindergarten, and his teacher suggested I speak to the campus SLP about his little brother. She had heard him talking, and noticed how hard he was to understand. He was assessed by the school district speech language pathologist at age three, and I attended his ARD meetings and listened to the reports. It was all a bit intimidating and confusing. That official meeting with administrators. All the technical terms. I didn’t need the novel, I needed the summary. What is going on, and what will we do about it? What kind of outcome could we expect? In understandable terms. So how can we help parents from the start to feel comfortable and partner with the SLP? Especially when beginning treatment for apraxia, parent involvement is so important to good progress. Explain what CAS is and how it is different from a developmental delay in articulation. Sometimes even SLPs have difficulty unraveling the official definitions. That’s ok. Skip the jargon. Use every day, conversational terms. As a parent on the opposite side of the table when my son was young, all those acronyms and the technical jargon were not very meaningful. I tell my parents that most often, children know what they want to say, but the brain gets the movements all jumbled up and the mouth and muscles don’t move in a coordinated way. It is natural for parents to wonder, what caused this? 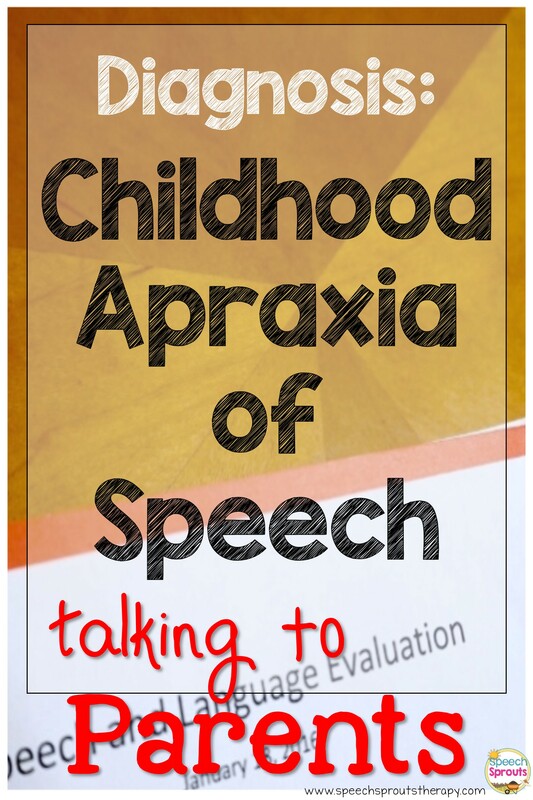 Why does my child have apraxia? 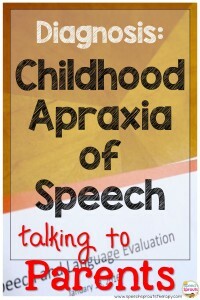 You can explain that it is generally thought that apraxia is neurological in nature. There are probably several factors involved and researchers are looking into it. Some children with CAS show evidence of damage to certain parts of the brain from birth or accident. Others show no signs of brain damage in scans. Some researchers are investigating how genetics may play a part. Most children with apraxia of speech make progress and become intelligible speakers. There are several approaches to therapy and one size does not fit all. Therapy will be tailored to their child’s needs and their response in therapy. Parent’s input is valued and respected. We will all work hard at it. Tell parents what they can expect from therapy. They will want to understand what therapy will look like, how long they can expect it to continue. (Most often for several years.) That sometimes progress is slow. That it will take tons of practice. That frequency and intensity may be greater in the beginning, and decrease over time as their child progresses. Help parents understand their role in therapy. Parents want to know how they can help. Why is practicing at home important? How will I know what to do? That first meeting is the perfect time to lay the groundwork for systematic home practice. And eventual dismissal. Build relationships with families from the very beginning. Partnering maximizes progress for your student or client and makes the therapy process more comfortable and beneficial for everyone! I am excited to say that I will be attending an intensive workshop on Childhood Apraxia of Speech (CAS) given by Dr. Edith Strand of Mayo clinic in April 2016. We will have only 25 attendees, so there should be lots of opportunities to ask questions and hopefully learn a ton! 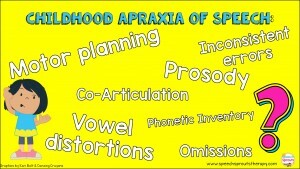 SLP’s, I would love to know what your questions would be about Childhood Apraxia of Speech, if you had a chance to ask. I will be making a list of questions to take with me, so leave a comment with yours!